3LB - Knowledge of the UK. 3LB have been looking closely at the different areas of the UK. We discussed what the U.K stood for, what countries we knew about, what cities we knew about and any landmarks. The children were really good at knowing all of the countries and could identify them clearly on a map. They were then able to identify and label some major cities, especially our capital, London. 3LB have looked closely at London. We talked about what we already knew about London, if anyone had ever been or if they knew anyone who lived there. The children were really knowledgeable about London and could tell me lots of different landmarks. We then looked at those landmarks in a lot more detail. We talked about what their uses were, why they are there and what they do for the city. The children then sketched some fantastic pictures of some of the most famous landmarks such as Big Ben and Buckingham Palace. After London, we decided to travel to Scotland. We looked at where Scotland was on a map in contrast to Leeds and England. The children quickly identified that it was the North of the UK. I then asked the children if they knew any of the cities in Scotland. They could tell me a few such as Glasgow and Edinburgh but by the end of the Lesson they could tell me many more! We looked mainly at the landmarks in Scotland such as Loch Ness, Edinburgh Castle, Holywood Castle and Arthur's seat. The children identified these on a map of Scotland by locating the cities where the landmarks were. The children were fantastic with their map skills! During Autumn 2 we have been studying the UK and looking at all the countries that make up the UK. In the first few weeks of term we had a look at where the UK was, what continent it was in and what different features it had. We have looked at London and discussed how it is our capital city and what the importance of a capital city is. We have also been doing lots of work on maps and how we can identify places using an electronic map of the world. 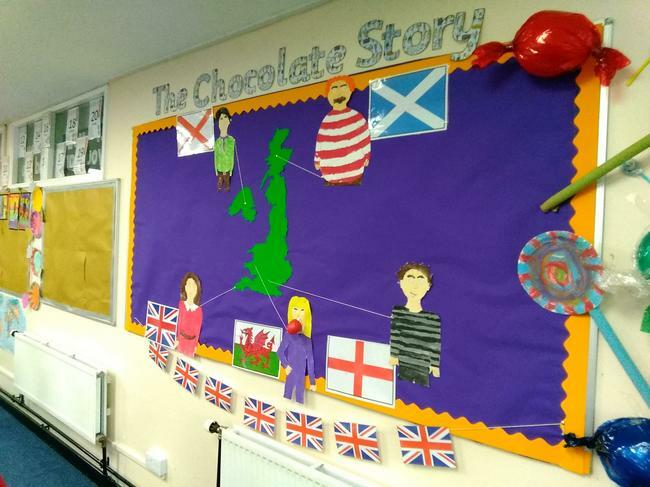 We have been building on our class display as we find out where all the different characters are from within the UK.